Click The Door To Enter. 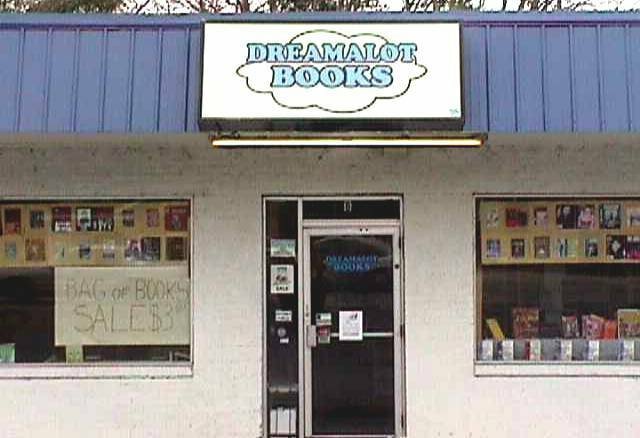 Dreamalot Books is a small family-run used bookstore located in Goose Creek, South Carolina specializing in used books. For over a decade our trading customers have guaranteed a constantly, ever-changing inventory of discount books in all the fiction and non-fiction genres. We strive to offer the cheapest prices on all our stock and make locating the titles you need or want as easy as possible. So if you're interested in science fiction paperbacks or christian books, rare or out-of-print books, bestsellers or even childrens books, then our store is for you. We also offer easy to print bibliography lists for best selling authors as well as book lists for many series. If we don't have the used book you need in stock then check out our New Books page or our eBooks page for links to other affiliate sites that may have what you need in stock. If you're a collector be sure and take a look at our Library Program designed to keep up with all the details of every book and all the music and movies in your personal library. So come on in and be welcomed into the world of Dreamalot Books.